Bollywood Dance is a mix of dance styles performed in Bollywood films, including traditional Indian styles of Bharatanatyam, Kathak, folk styles, and modern Jazz, Hip-Hop or Belly Dance. Jazz gives a dancer form and style while Bollywood allows you to experience and open up the body in a fun way. 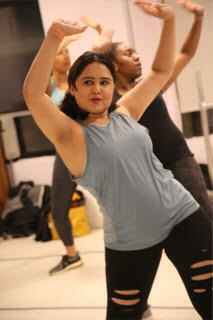 Its not just a fitness class, its a dance class! This class explores how the human body copes with coordination, memory challenges and the finesse of Indian dance all in one. You will go home with a great new choreography and movements that you will be able to incorporate with any dance style. This 60 minute class begins with the Warm up using Jazz style of Dance using structure and form making sure the body is ready to take the next 30 mins of high energy Bollywood dance routine and De structure thereafter. Pooja Uberoi is professional dancer, teacher and choreographer. Pooja has 13 years of Dancing and Teaching Experience. Pooja is trained in Indian dance forms such as Kathak, Bharatanatyam and Bollywood Dance. She is also trained in Ballet, Jazz and Contemporary Dance under some of the best teachers from Russia, Israel, Japan, Australia and USA.She has toured throughout India, U.S., Mexico, Puerto Rico and Israel with her classes and a Bollywood Musical she co directed and choreographed. She’s founder of the dance company IKIGAI, producer for NYC Dance week and founder of Funkar, a NYC-10 Initiative. Before moving to NYC, Pooja was head of a national dance school in India with over 800 students. She has choreographed full length Bollywood Musicals with adults and kids. Pooja has assisted in many Bollywood movies, TV shows and the Indian version of Sesame Street for Kids.Pooja is the Brand Ambassador for Dance USA Dance, NYC. She is also a consultant for a music school and runs an international artist management company called Artists East West.She recently received the 27th south asian women empowerment award for her work in NYC in the field of Dance.